Corn development has accelerated with the recent warm temperatures. Silage harvest has begun in some parts of Ohio with earlier planting dates. Proper harvest timing is critical because it ensures the proper dry matter (DM) content required for high quality preservation, which in turn results in good animal performance and lower feed costs. Harvesting corn too wet (low DM content) results in souring, seepage, and storage losses of the silage with reduced animal intake. Harvesting too dry (high DM content) promotes mold development because the silage cannot be adequately packed to exclude oxygen. Harvesting too dry also results in lower energy concentrations and reduced protein digestibility. Corn silage that is too dry is almost always worse than corn silage that is slightly too wet. So if you are uncertain about the DM content, it is usually better to err on chopping a little early rather than a little late. Follow the guidelines below to be more confident in your assessment. Corn preserved between 30 and 38% DM (62 to 70% moisture) generally provides excellent silage fermentation and animal performance. The optimal DM content varies with type of storage structure (Table 1). Table 1. Optimal dry matter (DM) contents for different storage structures. 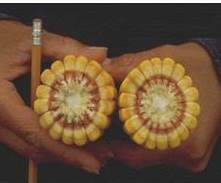 Dry matter content of whole plant corn varies with maturity. Research has shown that the position of the kernel milk-line is NOT a reliable indicator for determining harvest timing. Geographic location, planting date, hybrid selection, and weather conditions affect the relationship between kernel milk-line position and whole plant DM content. In a Wisconsin study, 82% of the hybrids tested exhibited a poor relationship between kernel milk-line stage and whole-plant percentage of DM. In Ohio, we have seen considerable variation in plant DM content within a given kernel milk-line stage. Appearance of the kernels should only be used as a guide of when to begin sampling for DM content, see section below When to Begin Field Sampling. The only reliable method of determining the optimal time to harvest corn silage is to sample and directly measure the percentage DM of whole plants. This information, combined with average whole plant dry-down rates, can be used to roughly predict the proper time to chop corn silage. Collect about 5 representative plants from the entire field, from areas with representative plant population and not from edge rows. Collect separate samples from areas that may have different dry down rates, such as swales, knolls, etc. The moisture concentrations of plants can vary within a field (plants will be wetter in low lying area and drier on knolls), and this should be considered when collecting your sample plants. As soon as the plants are collected, chop them uniformly (using a cleaver, machete, chipper shredder, or silage chopper) and mix thoroughly to obtain a sample with representative grain to stover ratios for DM determination. Put the representative sample in a plastic bag and keep it cool (refrigerate if possible). Some farmers prefer sampling only 2 or 3 plants without any additional sub-sampling to reduce the chances of a non-representative grain to stover ratio that can affect the results. In this case, choosing representative plants is even more critical. Make sure the sample does not dry down and keep it cool until the DM determination is performed. The accuracy of the DM value is largely affected by the care taken in sampling, drying, and weighing the samples. Whole kernels and cob pieces can be difficult to dry completely without burning the leaf tissue. From our work, on-farm measurement of DM is probably only accurate to +/- 2 units. So if you measure a DM of 30%, it could easily be 28 to 32%. Keep this in mind as you plan harvest timing. We know that kernel milk stage is NOT reliable for determining the actual harvest date, but its appearance is a useful indicator of when to begin sampling fields to measure plant DM content. Corn in Ohio should be first sampled to measure DM at full dent stage (100% milk, no kernel milk-line) for conventional tower or bunker silos. Full dent stage happens about 40 days after silking in Ohio. For sealed (oxygen-limited) tower silos, begin sampling when the milk-line is one-fourth down the kernel (75% milk remaining). It is important to begin sampling early as a precaution against variation in dry down. The milk-line of on these ears is about one-fourth to one-third down the kernel. This stage might be about right for oxygen limited silos but could be too late for conventional tower or bunker silos. Once whole-plant percentage of DM is determined, use an average dry down rate of 0.5% unit per day to estimate days until the optimal harvest moisture is reached. For example, if a given field measures 30% DM at the first sampling date, and the target DM is 35% for harvest, then the field must gain an additional 5% units of DM, thus requiring an estimated 10 days (5% units divided by 0.5 unit change per day).This procedure provides only a rough estimate for the harvest date. Many factors affect dry down rate, such as hybrid, planting date, general health of the crop, landscape position, soil type, and weather conditions. Early planted fields and hot and dry conditions can accelerate dry down rates to 0.8 to 1.0 % unit per day. Fields should be monitored closely and more frequently under those conditions. As mentioned above, corn silage that is slightly too dry is usually worse than corn silage that is slightly too wet. So harvesting a little early is usually better than waiting too long. For additional details on management of corn silage, see the article by Bill Weiss in the Buckeye Dairy News (August 2010), available online at https://dairy.osu.edu/bdnews/Volume%2012%20issue%203%20files/Volume%2012%20Issue%203.html#Harvesting.